Midway through week two of Stanford football training camp, starting roles at key positions, including center and outside linebacker, are still up in the air, but head coach David Shaw expects the competitions to become clearer early next week. As Thursday’s practice indicated, the grueling nature of two-a-days is starting to take a visible toll on the team. The players aren’t stepping off the gas pedal though — not when their entire offseason was spent training for this month; not when the season opener stands just a little over two weeks away. 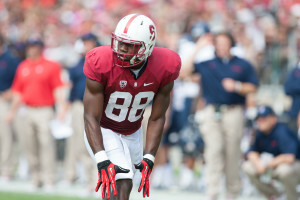 Shaw was impressed by senior nose tackle David Parry and fifth-year senior inside linebacker Shayne Skov last week, but it was junior wideout Ty Montgomery who garnered praise from the head coach on Thursday. Montgomery had a stellar freshman campaign with 24 receptions for 350 yards and two touchdowns, but a leg injury in 2012 limited his game action. One of the fastest players on the team, Montgomery’s performance this season will be critical for the Cardinal, which lost its top four targets in the passing game. So far, things have looked promising for the junior. The Cardinal also looks to replace the dependable Drew Terrell at punt returner, and according to Shaw, sophomore Kodi Whitfield may currently have a slight edge over Montgomery and redshirt freshman Barry J. Sanders. As for kickoff returns, Montgomery and redshirt sophomore Kelsey Young will resume their responsibilities from last season. After getting the rust off in week one, the players have been focusing on the nitty-gritty — more work on technique — in the past few practices. “It’s been a little cleaner on the defensive side of the ball,” said redshirt junior defensive end Henry Anderson.